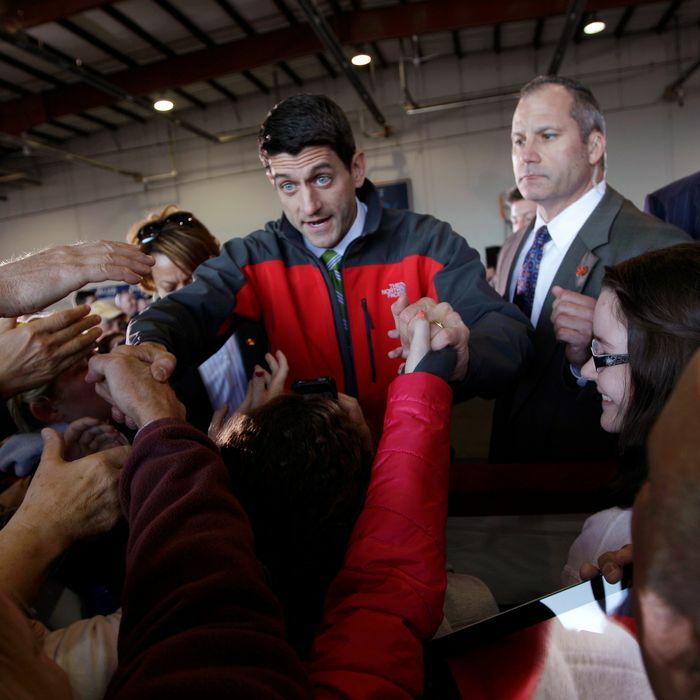 Paul Ryan greets supporters in Richmond on Saturday, November 3. So this is how the end begins: not with either a bang or a whimper, but instead with a frantic, sleepless, balls-to-the-wall, 72-hour sprint to the finish line. For any hard-core election junkie — and God knows your columnist is the kind of freak who enjoys simultaneously smoking, snorting, shooting, and speed-balling every available poll and prognostication, every gaffe and grand flight of oratory — this final period is the moment when to be on the hustings with the candidates is pure bliss, the true and only heaven. Ahhhhhh. Now, one might say that I’ve been on the road a fair amount in the past two months: Since the party conventions, I’ve hit all but one of the ten battleground states, managing only to miss Nevada (which is certainly odd but probably for the best, given my, er, complicated history with Las Vegas). But in the homestretch I’m picking up the pace, returning to five of those states — Virginia, Ohio, Pennsylvania, Wisconsin, and Iowa — with Barack Obama, Mitt Romney, and their running mates from now through Election Night, posting dispatches in this space as I go. My journey kicked off yesterday in the Old Dominion with a Paul Ryan event in Richmond, followed by the Obama-Bill Clinton rally in Bristow late last night. I’ll come back to the latter in my next post; here I’d like to focus on Ryan, whose rally yesterday in Virginia’s capital took place at a private aircraft hangar at RIC. Bounding down the steps of his plane in the bright sunshine, Ryan took the stage next to every important player in Virginia’s GOP Establishment: Governor Bob McDonnell, House Majority Leader Eric Cantor, and Senate candidate George Allen. The crowd was maybe a thousand strong, and they were psyched to see him. But his speech was brief (16 minutes), perfunctory, and a little whiny (“You remember hope and change? Remember how he would bring everybody together? He hasn’t met with our party leaders since last July.”) Underwhelming, in a word. This has become the conventional wisdom on Ryan: that after the initial burst of excitement and conservative energy following his selection by Romney in August, he quickly receded into the woodwork, becoming at best a non-factor in the race and at worst a disappointment. Certainly it’s the case that the expectation of many, me included, that Romney putting him on the ticket would mean a close-to-full embrace of his controversial budget plans and priorities by the ticket turned out to be in error. In fact, Romney quickly hightailed it away from the most incendiary portions of the Ryan record and platform, leaving his No. 2 a neutered figure — barred from making a full-throated case for the policies that earned him his reputation as the Republican Party’s intellectual and ideological leader. To my mind, only half of that reputation was deserved in any case: the ideological half. As an intellect, Ryan has always struck me as wildly overrated, and the case for his political “courage” dramatically overstated. (His refusal to lay out in detail the tax deductions he would limit or do away with in order to bring his plan to the revenue neutrality he claims for it is, indeed, the very opposite of courageous — it’s a standard-issue waffle, smothered in the special syrup reserved for politicians who tout the need for “hard choices” but then duck enumerating any that would affect their own bases.) But even if Ryan were all that he’s cracked up to be, the position of being another man’s running mate was never going to be the place to strut his stuff. Having said all that, however, I think the conventional wisdom is wrong that Ryan will emerge from this campaign — assuming Romney loses — with his standing in any way diminished, at least among those Republicans who were favorably disposed to him in the first place. For any running mate, the two consequential events of a presidential campaign are the speech he delivers at his party’s convention and the performance he turns in at the VP debate. And although Ryan’s oration in Tampa was widely (and rightly) pilloried for its inaccuracies and evasions, it thrilled most conservatives, just as his turn in Kentucky against Joe Biden, despite being trashed by the left, was seen on the right as perfectly creditable, bordering on strong. All of which is to say that, again if Romney comes up short, Ryan almost certainly will still have a big future in the GOP. As I and others have noted, there is going to be an epic struggle for the soul of the Republican Party if Obama is reelected, with recriminations aplenty regarding Romney’s failure to bring home an eminently winnable election. But no one is going to blame Ryan for that, and he will surely come through the storm with an enhanced reputation among the Randian faction of the party, not to mention nearly 100 percent national name recognition, and the invaluable experience of having played the game on the national stage. Assuming that he runs for president in 2016 — a statement akin to “assuming Heilemann quaffs a bourbon in the next six hours” — Ryan is all but guaranteed a top-tier position in the Republican nomination sweepstakes. The Democratic side understands the importance of Virginia too — which is why they rolled out the big guns (or, rather, the Big Dog and The One) in the state last night. But the fact that Obama won’t be back again before Election Day is telling. And that, along with the inestimable role that Bill Clinton is playing in these final hours, will be the topic of the next Impolitic.